Hace unos días proponíamos que el futuro pasaba por la Internet of Things basada en una nueva generación de redes wifi. Esta combinación sería la base de las “ciudades inteligentes”. Los “networked objects” que crean la Internet of Things representan la penetración de lo virtual en los espacios físicos. Pero existe otro futuro complementario, en que los espacios físicos y nosotros mismos nos “introducimos” en la web. Podríamos llamarlo web 3.0 y sería el resultado de la combinación de tres elementos: las piezas de la web 2.0, espacios de trabajo colaborativos 3D y herramientas de diseño de mundos sintéticos o virtuales basados en juegos online multijugador o MMORPGs. Eleanor Wynn, a “social technology architect” in Intel’s Information Technology Group, is working on a more sophisticated teleconferencing program inspired by the 3-D graphics and multitasking of online games. 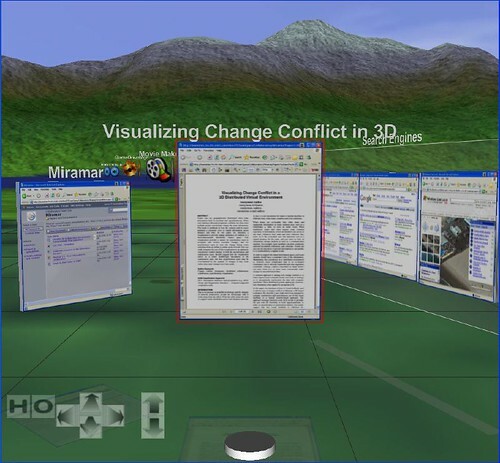 The program, called Miramar, displays documents, contacts and communication links floating in a virtual landscape. Because the view appears to be three-dimensional, each person at the meeting can see and use more of those tools than on an ordinary 2-D computer screen. El post de 3pointD.com especula con un futuro en que un usuario pueda tomar un documento de Miramar y pasarlo al MMORPG más colaborativo y personalizable, Second Life. For the purposes of production, I created an alternative avatar to minimize unwanted contact and distractions from other Second Life residents. I could have purchased a private plot of land for building, but instead opted to use a series of public sandbox areas to save costs (whatever I built would only need to stand for a day or two). The choice of an alternative avatar turned out to be a minor mistake, as I had to transfer many of my custom textures as well as Linden Dollars from my main avatar. It took a little bit of extra time to log in and out between the two avatars. The use of public sandbox areas meant that I was, on rare occasions, interrupted by curious avatars, weapons-testers, and troublemakers. If Linden Lab (makers of Second Life) offered an offline client for building, I would have gone this route. I couldn't have created the concept screens without using Second Life as a production tool. The work took longer than I expected, but considering the final product compared to the relatively short execution time, it seems Second Life can be a cost-effective way to get concept work done. 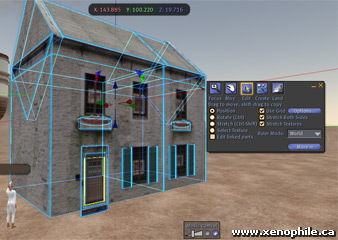 Despite being a good overall tool, Second Life's building features were buggy and frustrating at times. I wouldn't recommend the software for highly-polished work, but for rapid 3D prototyping, it seems hard to beat. … these tools could possibly be used to recreate communities and whole cities, to demonstrate the redesign of public places, for instance. Or , even to give a community, college students, or a design team a sort of "3D wiki" of their community to work with? There are lots of possibilities and potentials here. Perhaps all of the potentials are not currently possible in Second Life as it exists right now. many of them do not seem too far off or out of reach, though. ¿Qué pasará cuando Intel empiece a utilizar Second Life y la web 2.0 para diseñar sus entornos de trabajo?. ¿Y cuando esos entornos se creen open source?.